Frantic Mama? Too obvious. 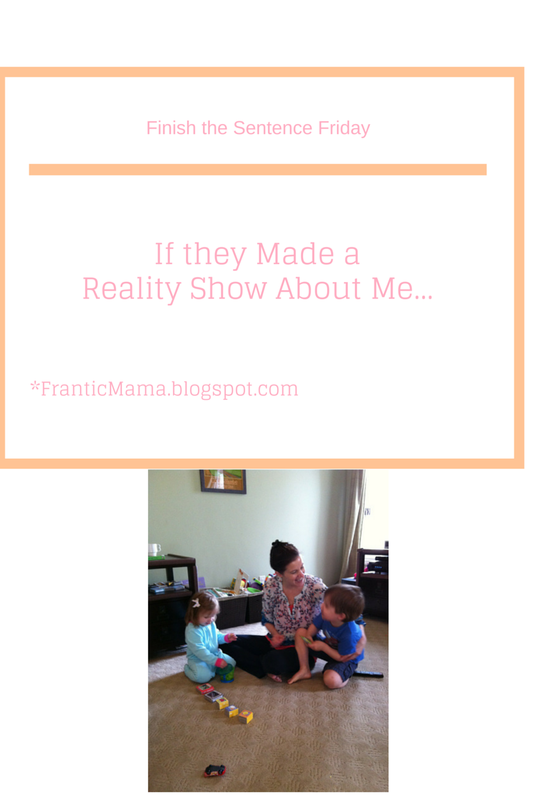 How about A Day in the Life of an Ordinary Mom? Too boring. Or maybe not. Unlike the Duggars, the Honey Boo Boo people, or the Duck Dynasty folks, there is nothing too unusual that sets my family apart from thousands of others around the country. We don't have 19 kids and counting. None of us are in pageants with Boo Boo in our nicknames. Nor are we millionaires with long beards living in the country. I don't mean this as a negative to my family-- or to the ones I'm mentioning-- it is just the truth. My family is simply this: a two-parent household with two young children, trying to make it through each day with love and as much enjoyment as we can muster. If there were to be a reality show featuring us, I suppose I could concoct all kinds of crazy staged scenarios to get the ratings up. We live in a Look-at-Me culture, after all. I'm sure my 4-year-old would have a blast spraying shaving cream around Target for an episode. My 2-year-old would adore getting to run wild at an amusement park. Both would get laughs and judgement from a t.v. audience. But if there were a world where ratings didn't matter to networks, and people could just watch what they wanted, perhaps an ordinary life would be surprisingly interesting. Think about TLC's show "Bringing Home Baby." I haven't watched it in years, but I was glued to shows like it when I was pregnant with my first baby. They document real-life families about to bring home a new baby. There was usually nothing unusual about these mothers-- maybe that's why I was so drawn to them. The families generously offered a glimpse into what was then unknown to me: life as a new mother. My show wouldn't break new ground. It wouldn't be very glamorous. It wouldn't be salacious or juicy. But maybe it would be simply nice. Sometimes funny. Other times sad. Occasionally joyful. How life actually IS. What would the name of your reality t.v. show be (not that you would ever do one, of course)? *This is a Finish the Sentence Friday Blog Hop Post! See other participants here. Need more laughs? Check out the humor anthology I contributed to, Clash of the Couples!